We regret to announce that Fr. Robert MacKenzie, a retired priest in our Archdiocese, has been charged with child sexual abuse for offenses in Scotland several decades ago. 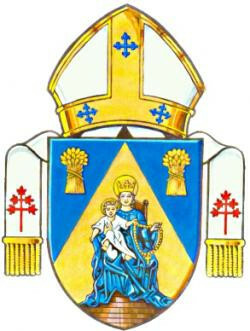 Details can be found by clicking on the link below, which will lead to a letter from the Archdiocese. In recognition and appreciation of long term involvement in the liturgical ministries and volunteering in the parish, St. Vincent de Paul Parish Pastoral Council offers bursaries in the amount of $1,000 to graduating Grade 12 students who are enrolled in post-secondary education. 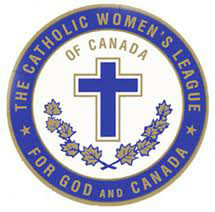 Has volunteered a minimum of 30 hours within the parish during their Grade 10 to 12 years. Applications must be submitted to the church office by May 15, 2019. Application forms can be found in the church foyer, or can be printed by clicking here. We are a community alive with the Good News of Jesus Christ, celebrating joyfully together, and reaching out in justice and love to share our faith with the world. the reason for our existence and the source of our growth. 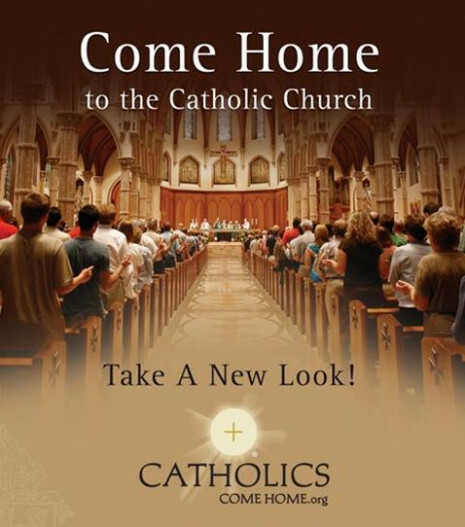 Welcome Visitors and New Parishioners! 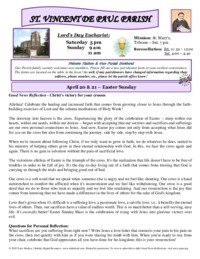 New parishioners are encouraged to fill out a parishioner registration form in the foyer or download the form here and return it to the parish office or simply drop in the collection basket. Please call the parish office to register for an upcoming Baptism Prep course. Parents are welcome to attend the class before the arrival of your child. Please read all the important information you need to know about Baptism under the "Sacraments" tab, prior to calling to register. Thank you. 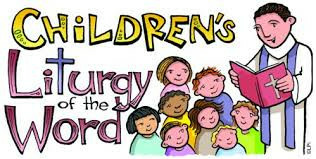 Children aged 3 - 6 are invited to attend Children's Liturgy. They will hear the gospel at their level, have prayer time, music and crafts. They are called forward after the opening prayer and return during the offertory. Children are also invited up to the altar to play rhythm instruments to the final song! With your help we strive to be a scent free church! Many of our parishioners suffer from adverse affects to scents from perfumes, lotions, after shave products, essential oils, etc. 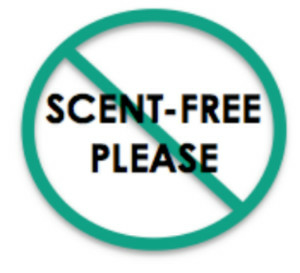 We appreciate you refraining from the use of scented products when attending St. Vincent de Paul. Thank you ! Latest copy of "The Arch"
Make sure to like our page and watch for upcoming events! 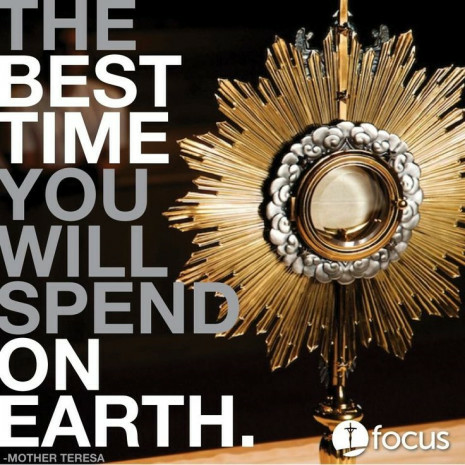 Adoration is held the First Friday of each month following the 12:10 Mass with Benediction at 5:00 p.m.
Eucharistic Adoration involves honouring and contemplating the mystery of Christ in the Blessed Sacrament, spending time in spiritual conversation, silent meditation and heartfelt love for Christ's gift of Himself in this sacrament. 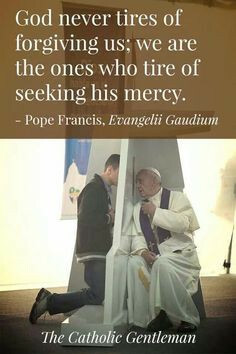 We might present to the Lord our little acts of faith, adoration, love, thanksgiving, repentance, reparation and charity.